The Wheat penny was the inaugural series of the Lincoln cent and is today a staple of coin collections everywhere. The Wheat penny, which replaced the Indian Head penny, began in 1909 as a way to honor Abraham Lincoln on the bicentennial of his birth year. The idea for the coin was conceived by President Theodore Roosevelt. The Wheat penny started an important trend in American coinage. Whereas most previous and contemporary coins used imagery depicting animals or imagined persons like the symbolic Lady Liberty, the Wheat penny featured a real figure from American history. This trend would go on to inspire all manner of coins, from the Washington quarter to the Roosevelt dime to the Franklin half dollar. It was Lithuanian medalist Victor David Brenner who designed the Wheat penny. The obverse features a profile bust portrait of Lincoln with the legend “LIBERTY” in the left field, the year of mintage on the right, and the motto “IN GOD WE TRUST” along the top. Throughout its mintage the design of the Wheat penny was altered in small ways, such as removing Brenner’s initials and then placing them in a new location. 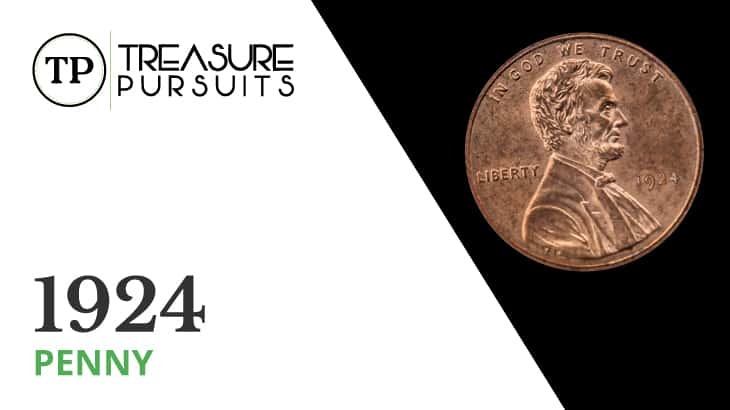 The composition of the Wheat penny was 95% copper and 5% tin and zinc in all issues except 1943, when America’s involvement in World War II forced the Mint to temporarily mint pennies in steel-plated zinc. The Wheat penny was minted until 1958, when it was replaced by the Lincoln Memorial penny. 1924 saw an overall average mintage for the Wheat penny. Struck in Philadelphia, Denver, and San Francisco, a total of around 90 million pennies were produced. Philadelphia was responsible for the majority, with 75,178,000 pennies struck there alone. This issue tends to exhibit quality strike and luster, although some specimens exhibit signs of overused dies. Denver, producing cent pieces for the first time since 1922, struck 2,520,000 pennies in 1924. Most examples have poor strike quality; however, their scarcity in all grades, especially Mint State, keeps them in demand and means that they command fair premiums. 11,696,000 pennies were struck at San Francisco in 1924. Much like the Denver issue, these San Francisco cents were generally of poor quality due to overused dies necessitated by budget cuts. Nevertheless, San Francisco examples are very scarce in grades above Very Fine, to the extent that 1924 is considered a semi-key date for San Francisco Wheat pennies. The 1924 penny is typical for the series in its composition of 95% copper and 5% tin and zinc and in its diameter of 19 millimeters and its mass of 3.11 grams. Philadelphia mintages are by far the lowest in value, as they are the most common. They are worth $0.20 in Good-4, $0.30 in Very Good-8, $0.40 in Fine-12, $0.87 in Very Fine-20, $5.15 in Extremely Fine-40, $10 in About Uncirculated-50, $25 in Uncirculated (MS-60), and $50 in Uncirculated (MS-63). Values increase quickly to $21 in Extremely Fine-40, $75 in About Uncirculated-50, $127 in Uncirculated (MS-60), and $231 in Uncirculated (MS-63). Denver issues command the highest values overall: $41 in Good-4, $46 in Very Good-8, $50 in Fine-12, $60 in Very Fine-20, $127 in Extremely Fine-40, $205 in About Uncirculated-50, $322 in Uncirculated (MS-60), and $360 in Uncirculated (MS-63). All issues become quite valuable in MS-65 and above, some even reaching values in the tens of thousands of dollars. One more factor can determine the value of a 1924 Wheat penny: its color. Wheat pennies, as with all copper coins, come in Brown, Red-Brown, and Full Red. Full Red is the most desirable color and also the most valuable. To get an idea of the difference this color can make, let’s take a look at an MS-65 San Francisco issue. In Brown, the coin is worth $1,600. In Red-Brown, the same coin is worth $3,950. In Full Red, the value jumps to an astonishing $29,000, and such a coin sold for $43,000 in a 2005 auction.